25 million people worldwide rooted for Diana Nyad as she approached the Florida shore, at long last achieving her 35-year-old dream of becoming the first person to swim from Cuba to Florida. Diana is not one to quit. On her fifth attempt, speaking the words “Never Ever Give Up” to the wildly cheering crowd on a Key West beach on September 2, 2013, Diana may have been dazed and physically spent, but she showed the world what persistence and belief can manifest. Diana stroked the amazing 110.86 miles in 52 hours, 54 minutes, 18 seconds. A worldwide response of inspiration came flooding toward Diana, from personal messages from President Obama and Hillary Clinton to literally millions of people who felt their own lives lifted with Diana’s “Find a Way” philosophy. Courage, bold vision, and the ability to articulate her life philosophies have propelled Diana through an inspiring life. Her memoir, Find a Way, is now in bookstores and available on Amazon.com She has written three other books and speaks French and Spanish fluently. Diana has also earned the reputation of a uniquely entertaining and inspiring public speaker and has taken her one-woman stage show “ONWARD!” to a theatrical performance. Diana’s Cuba Swim Head Handler and best friend Bonnie Stoll, are on a mission called EverWalk, to lead us walking along the epic outdoor corridors of America. Diana and Bonnie intend to turn us into a nation of millions of walkers. In 2014, Norma Bastidas a single-mother, a survivor of sexual violence, human trafficking and ultra athlete broke the Guinness World Record for Longest Triathlon after swimming, biking and running 3,762 miles (6,054 km) from Cancún, Mexico to Washington, D.C. She views this incredible athletic feat as a metaphor for the incredible trials faced every day by the survivors of human trafficking and sexual violence. Norma’s mission is to educate and empower, demonstrating to the world that one’s past does not dictate one’s future, and prove that everyday people are capable of making extraordinary strides in the fight against the problems facing the world today. 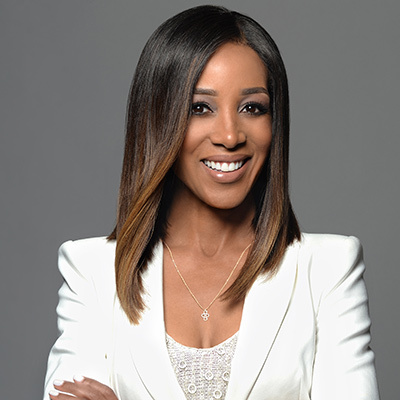 Emmy Award-winning journalist, television personality, author, producer, philanthropist and girls’ empowerment activist, Shaun Robinson is a true role model. She has won the respect and admiration of millions of daily television viewers throughout her career, including her work as co-host of the entertainment news show, Access Hollywood. Shaun has interviewed Hollywood’s biggest stars and covered the red carpets and hosted the official pre-shows for the Academy Awards, Golden Globes, Emmy’s and Grammy’s, in addition to hosting NBC’s coverage of the annual Tournament of Roses Parade. Coming from a strong background in television news, Shaun has contributed reports to NBC Nightly News, Today Show, MSNBC and CNN. She has served as a guest host on The View, HLN’s Joy Behar Show and been featured as a panelist on Larry King Live, Piers Morgan Tonight and Dr. Drew. Shaun has also served as host for programs on Lifetime, TLC and BET networks and was a guest host on Who Wants to be a Millionaire? Among her awards, Shaun won an Emmy for her live coverage of A Grand Night in Harlem for the Black Sports and Entertainment Hall of Fame. She received a distinguished Gracie Award for her work on BET Takes Hollywood profiling the history of African Americans and the Oscars. Shaun captivated audiences as the premiere host of TV One Access, for which she received the Outstanding Coverage of Race & Ethnicity Award from Columbia University. The Ford Foundation has honored Shaun for her special on Missing in the Media which focused on the lack of media coverage surrounding missing women of color. Shaun has also received prestigious awards from the Associated Press and American Women in Radio and Television. Shaun has also built her acting resume with roles in Bruce Almighty, Dr. Dolittle 2, America’s Sweethearts, Law & Order:CI, Real Husbands of Hollywood, Last Man Standing, Monk, Everybody Hates Chris, Charmed, Days of Our Lives, and The Proud Family. Prioritizing her goal of being a positive role model, Shaun recently announced the creation of her own nonprofit to help empower girls and young women. The S.H.A.U.N. Foundation for Girls supports small, grassroots charities that are doing work in five key areas of girls issues: (S)TEM, (H)EALTH, (A)RTS, (U)NITY and (N)EIGHBORHOODS. Shaun and her foundation were recently featured on the CBS show, Hidden Heroes. The issue of girls and self-esteem has been a lifelong passion for Shaun. As an author, her first book, Exactly As I Am: Celebrated Women Share Candid Advice with Today’s Girls on What it Takes to Believe in Yourself (Ballantine), put together the collective wisdom of both superstar women and everyday teenagers. Shaun was honored with an invitation from the U.S. Ambassador to the Bahamas to speak to the commonwealth’s girls about her book. Shaun was also honored with DOVE’S first Real Beauty Award as a role model who is helping girls feel more comfortable in their own skin. Shaun currently sits on the advisory board of Girl Up - the United Nation’s Foundation’s adolescent girl campaign. She served on the national board of Girls, Inc. and was awarded the Inspiring Woman Award by the Los Angeles Sparks. Shaun created One Girl, One Voice: A Million Ways to Make a Difference - the social media movement calling for one million socially responsible girls to pledge to use their voices for positive change in the world through volunteering. Because of her commitment to the cause, Shaun was recently invited to join Women Moving Millions. Each member in this global philanthropic community has pledged to give at least one million dollars to initiatives promoting gender equality across the globe. Shaun also served as the spokesperson for the Los Angeles County Share Your Heart, Share Your Home foster care and adoption program and worked with the national literacy organization, Jumpstart. She also served at the official spokesperson for the Heart Rhythm Society’s Arrest the Risk campaign, focusing on African Americans and heart disease. Her HRS PSA was honored with the Spirit of the Heart Award by the National Association of Black Cardiologists. Prior to coming to Hollywood, Shaun was an anchor/reporter in Miami where she anchored coverage of Hurricane Georges which devastated the Florida Keys. She also anchored in Austin, Texas where she reported from the notorious Texas State Penitentiary in Huntsville interviewing prisoners on death row. Prior to that, Shaun was an anchor, health reporter and talk show host at the ABC affiliate in Milwaukee and was an anchor/reporter at the CBS affiliate in Flint, Michigan. Shaun began her TV career in her hometown of Detroit, Michigan working as a reporter, anchor and talk show host. Shaun currently resides in Los Angeles and is a graduate of Spelman College in Atlanta.